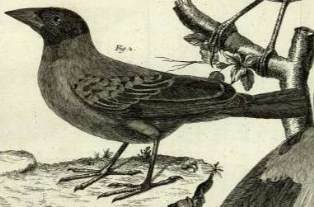 The Village Weaver was described by Philipp Ludwig Statius Muller in 1776. Statius Muller was a German zoologist who published a German translation of Linnaeus's Natursystem. The supplement in 1776 contained the first scientific classification for a number of species, including that of the Village Weaver. Statius Muller gives his source as Buffon, a French naturalist who was the director at the Jardin du Roi, now called the Jardin des Plantes. 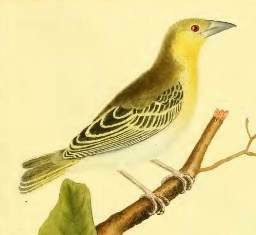 Although Linnaeus had access to the bird descriptions in Brisson 1760, strangely he did not describe the Village Weaver in his 12th edition. Buffon based his work largely on that of Mathurin Jacques Brisson. Brisson gave the first names ever to the Village Weaver, as "Le Pincon du Senegal" (French) and Fringilla senegalensis (Latin). Brisson noted that the Village Weaver originated from Senegal, from where it had been sent to RAF de Reaumur in France by Michel Adanson, who also collected the Red-billed Quelea. The first colour illustration of the Village Weaver is in the book by Edme-Louis Daubenton, containing coloured engravings by Francois-Nicolas Martinet. Oriolus cucullatus	Statius Muller 1776	Natursyst., Suppl., p.87	Senegal. cucullatus (Late Latin) hooded (L. cucullus, a hood or cowl). Black-headed Weaver, Black-hooded Weaver, Layard's Black-headed Weaver, Mottled Weaver, Mottled-backed Weaver, Spot-backed Weaver, Spotted-backed Weaver, V-marked Weaver. Identification. The Village Weaver is one of the most common, widespread weaver species. It is larger than most weavers, with a red eye in both sexes and a heavy black bill. The plumage varies through its wide range (see also subspecies below). 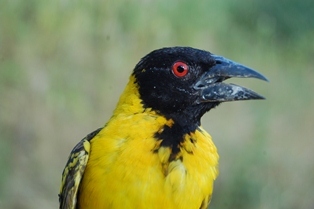 The breeding male has the head mainly black (except the crown is yellow in spilonotus); the nape, hind neck and breast below the black throat are chestnut in West Africa and yellow elsewhere. The back is either yellow with a black "V" formed by the scapulars (West Africa to Ethiopia) or spotted. The male Speke's Weaver P. spekei has a pale yellowish eye, and a very different song. The breeding female is yellow below, and whiter on belly; most subspecies have a yellow superciliary stripe. The non-breeding birds are duller than the breeding female. 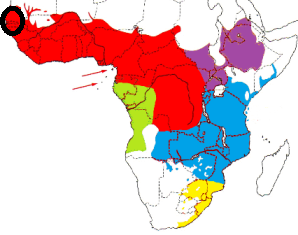 P. c. cucullatus in West Africa and most of DRCongo; also on Bioko island (see red on map). P. c. collaris in south Gabon to west Angola (see green on map). The male has a black mask extending back to the nape, the mantle is flecked black and yellow, a broad chestnut band on the breast around the black bib, and chestnut flecking on the flanks. P. c. abyssinicus in Sudan to Kenya (see purple on map). The male has a black V-shape on the mantle like the nominate, but differs in having a chestnut crescent on the hindcrown and yellow collar on the nape. P. c. nigriceps in Somalia to east Angola and north Mozambique (see blue on map). 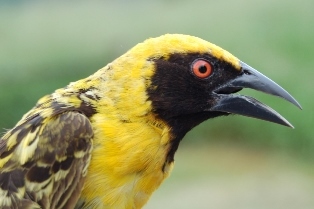 The male has a black head lacking brown on the crown or nape, the mantle is flecked with yellow and black, and golden-yellow underparts with no brown wash.
P. c. spilonotus in southern Mozambique to South Africa (see yellow on map). The male has a yellow forehead and crown, the mantle is flecked black and yellow, and the underparts are plain yellow. 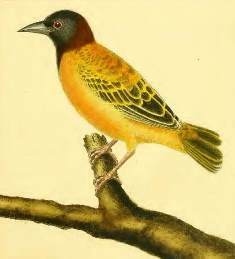 The Village Weaver was introduced in the West Indies (nominate subspecies), on Mauritius and Reunion (spilonotus), and probably introduced on Sao Tome (nigriceps). Habitat. The Village Weaver inhabits bushy savanna, riverine woodland, wetlands, cultivated areas, rural villages, urban and suburban gardens, and villages and clearings in forest. It is frequent associated with human habitation in west and central Africa. It is absent from arid regions, dense forest, and miombo woodland. Food. Its diet is seeds, including grass seeds and cultivated cereals. It is regarded as a pest in rice-growing areas, and also damages maize, sorghum and durra crops. It also feeds on fruit, nectar, and insects, such as beetles, ants, termites and their alates, grasshoppers, mantids, caterpillars, and bugs. It forages by gleaning vegetation, including tree trunks, and visits feedlots. Experiments with captive birds indicate that it uses colour to discriminate between different seed types, rejecting bitter-flavoured varieties. The Village Weaver is gregarious, being found in large flocks; and in the non-breeding period joins large communal roosts. Breeding. The Village Weaver is polygynous, with up to five females simultaneously on the territory of a male, and up to seven during a season. Females may change mates in a season, e.g. one ringed female was successively mated to three different males. It is highly colonial, with more than 200 nests in a single tree and colonies in excess of 1000 nests. The numbers of nests per territory (3-4) is similar in dense and sparse colonies. Larger colonies appear to be more attractive to females, with a higher proportion of females per male. It often breeds in mixed colonies with other weaver species. When females enter a colony, males hang below their nest entrances while giving nest-invitation calls and flapping their wings to show the yellow underwings. The nest is spherical, sometimes with a very short entrance tunnel. The nest is woven by the male within a day, generally from strips torn from reed or palm leaves. The male often includes a ceiling layer of broad leaves. The female lines an accepted nest with leaves, grass-heads and some feathers. Nests are suspended from drooping branches (usually 6-18 m above the ground), supported at the sides by reeds (1-2 m above the water), or occasionally hanging from telephone lines. Some colonies are placed in heronries or attached to the nests of raptors. A single male may build more than 20 nests in a season, and unused or old nests are regularly destroyed to make space for new nests. Empty nests may be occupied by other animals, including snakes, wasps, mice and bats, and nests may be used for breeding by a wide variety of species including Cut-throat Finches Amadina fasciata. The eggs are white, pale green or blue, either plain or variably marked with red-brown speckling. Incubation is by the female only, for about 12 days. The chicks are usually fed by the female alone, but males in some parts help. The Village Weaver is regularly parasitized by Diederik Cuckoos Chrysococcyx caprius. Female Village Weavers recognize their own egg pattern, which are constant throughout her life, and discriminate against non-matching eggs. Nest predators include snakes, especially boomslang Dispholidus typus, monkeys and baboons, crows and raptors. The longevity record is 14 years in the wild and 24 years in captivity (see more weaver longevities here.